INDIANAPOLIS and TEL AVIV, December 30, 2014 -- Global Water Technologies (OTC Pink: GWTR) announced plans to work with an innovative company from Israel on smart meter solutions that provide real-time data and remote control solutions for water utilities and their customers. A non-binding Memorandum of Understanding (MOU) was signed to coincide with a trade mission to Israel by Indiana Governor Mike Pence and the Indiana Economic Development Corporation. The MOU recognizes the innovative and entrepreneurial focus of both economies, their strategic positioning in the emerging water sector and the intent of both companies to explore opportunities to commercialize and deploy new water technologies. Global Water Technologies has assembled a portfolio of smart water tools that combine innovative software and hardware solutions to diagnose, monitor and improve the efficiency of drinking water and wastewater distribution systems. These buried assets are a vital part of the infrastructure that are often ignored until critical sections fail and cause extensive damage. The Israeli company has pioneered a new standard of secure technology for two-way remote meter solutions that allow water utilities to better serve their customers with real-time data. This innovative technology was developed in Israel and has been deployed in its home market and in key export markets. Now the field proven system will be available to improve water efficiency in the United States, where water issues have become a growing concern. 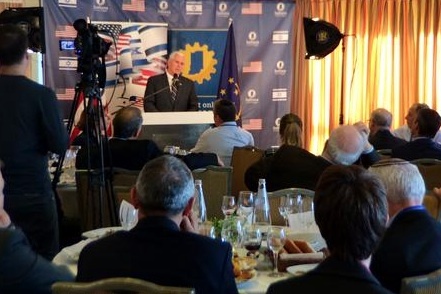 The trade mission connected dozens of leading business and government leaders and activities on December 30 included an Invest in Indiana breakfast meeting followed by a U.S. - Israel Business Initiative luncheon.